Step-by-step instructions with callouts to iMovie screenshots that show you exactly what to do. Help when you run into iMovie problems or limitations. Tips and Notes to help you get the most from iMovie. 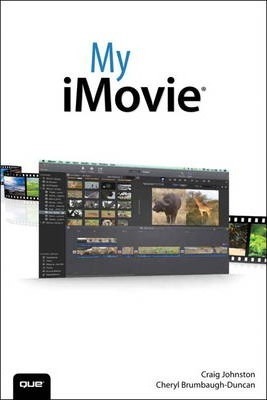 Full-color, step-by-step tasks walk you through everything you want to do with iMovie. Craig James Johnston has been involved with technology since his high school days at Glenwood High in Durban, South Africa, when his school was given some Apple ][ Europluses. From that moment, technology captivated him and he has owned, supported, evangelized, and written about it. Craig has been involved in designing and supporting large-scale enterprise networks with integrated email and directory services since 1989. He has held many different IT-related positions in his career ranging from sales support engineer to mobile architect for a 40,000-smartphone infrastructure at a large bank. In addition to designing and supporting mobile computing environments, Craig cohosts the CrackBerry.com podcast as well as guest hosting on other podcasts, including iPhone and iPad Live podcasts. You can see Craig's previously published work in his book Professional BlackBerry, and many books in the My series, including books covering BlackBerry, Palm, Nexus, HTC, DROID, and Samsung devices. Craig also enjoys high-horsepower, high-speed vehicles and tries very hard to keep to the speed limit while driving them. Originally from Durban, South Africa, Craig has lived in the United Kingdom, the San Francisco Bay Area, and New Jersey, where he now lives with his wife, Karen, and a couple of cats. Craig would love to hear from you. Feel free to contact Craig about your experiences with My iMovie at http://www.CraigsBooks.info. All comments, suggestions, and feedback are welcome, including positive and negative. Cheryl Brumbaugh-Duncan is committed to education and technology. For more than 15 years Cheryl has run her own company, Virtually Global Communications - VGC, a Web design and development company with a focus in education. Armed with a Master's degree in Education, as well as being an expert in web design and development, she has been developing cutting-edge websites and mobile Internet applications, and teaching individuals and companies about computers, technology, and web design and development. Combining web technologies and education strategies, Cheryl has developed and authored books, instructor-led training curriculum, and online education courses for clientele that include QWEST, Que, Alpha Publishing, New Riders Publishing, ADIC, Dell, Virtual Training Company-VTC, and Sun Microsystems. Cheryl has been an avid Apple Computer enthusiast for years, ever since Apple captured the education market back in the 1980s. From that time until today, she has used Apple products for her work and personal use. She has authored and taught training classes on Apple products and has used the Apple iLife suite of software since it was introduced-this includes the iMovie software product. Cheryl currently teaches college classes in web development and design. Her commitment to the combination of education, technology, and various delivery methods for communicating information keeps her very busy in this ever-changing world. Please visit her website at www.virtuallyglobal.com to learn more about Cheryl and her company Virtually Global Communications.